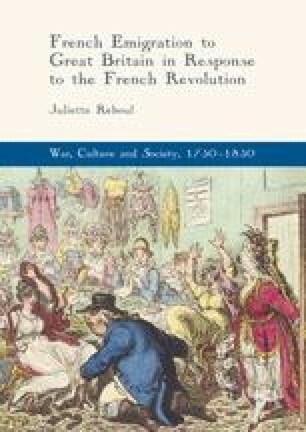 This chapter discusses the construction and identification of the French emigrant persona in British public and private discourse. In Loyalist Britain, the legislative, administrative and social control of aliens engendered a climate of suspicion in which foreigners were likened, by default, to political enemies and religious dissenters. In this ideology, the accepted figure of the refugee-emigrant was used as a rhetorical prop to demonstrate the munificence and superiority of British constitutionalism and Anglicanism. This argument utilizes State legislation, newspaper articles, pamphlets and sermons, satirical imagery and private correspondences.